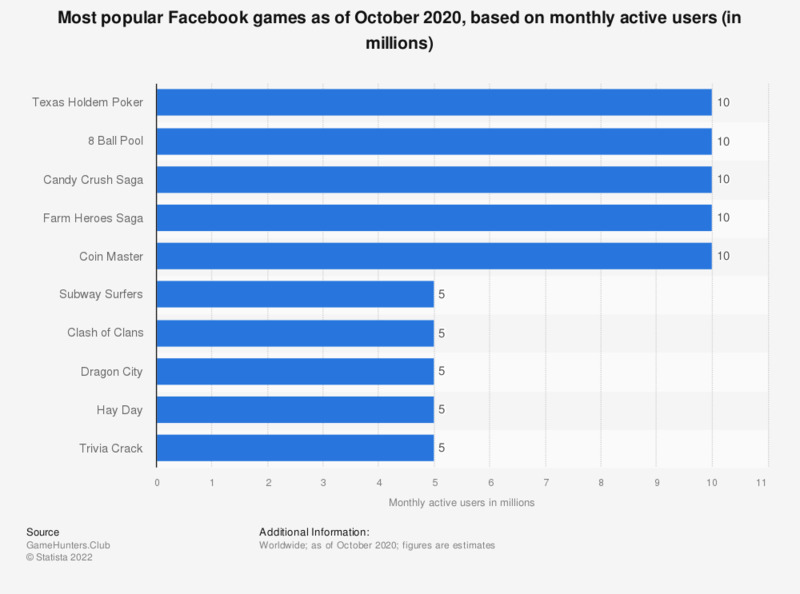 This statistic lists the most popular Facebook games, based on monthly active users. As of March 2019, Candy Crush Saga had approximately ten million monthly active users on Facebook. Fifth-ranked Subway Surfers had five million MAU in the same period. This title also managed to secure a spot in a ranking of leading Android games by global downloads in January 2019. That month Subway Surfers ranked third, with more almost 20 million downloads worldwide. What is more, Subway Surfers, had a 22.7 percent reach among Android mobile device users worldwide in 2018, and Candy Crush Saga followed with a 19.8 percent penetration.